The cover image is a detail from Boat by Migle Semetaite. 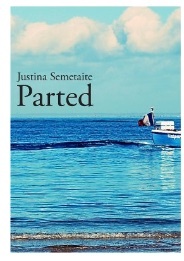 From the opening lines of Justina Semetaite’s Parted, “The jelly shadows of the birds / sitting on the fence,” we know we are in good poetic company: the kind that’s able to think laterally about language, treat it as the physical stuff that it is, whilst also working it lyrically, languidly, in a book as private yet communal as singing the national anthem (but which one? ).